A curved staircase is quite an engineering feat in homebuilding. 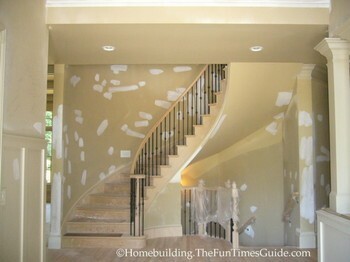 Some would even say that creating beautiful staircases for homeowners is a form of art. The engineering that is involved in building staircases can be mind-boggling. Think of how many movies you’ve seen (e.g. Gone With The Wind, Scarface and too many to name) where the staircase that the movie star walked down, danced down, fell down or even tumbled down was a major part of a scene. What I’m trying to say is that staircases can be very dramatic. My latest new home viewing excursion led me to a 3-story home, built by Donny Brook Homes in The Park at Anderson Farm in Marietta, where curved staircases were the very first thing you laid eyes on when you walked through the oversized French entry doors. The curved staircases have been installed but they have yet to put the finishing touches on them (not to mention the walls surrounding them that have been touched up recently). The curved staircase leading to the upstairs level (there’s an entry level, a terrace level and upstairs level) is what is known as a "free standing inside radius with returned treads". To learn alot more about staircase terminology click on this link from Southern Staircase of Alpharetta, GA. The staircase leading to the terrace level is what I’d call a "ratcheted-multi-landing-curved-staircase." I’m quite certain that they have a much more technical term for it than I’ve suggested here. I’ve seen the Southern Staircase nametag on many, many staircases during our home viewing excursions. They have this staircase-building-thing down to a science…literally. Check out this link to read more about the sophisticated methods that they employ in order to handle a multitude of standard to custom staircase orders. They can do it all! We pulled out all of the carpet in our home a couple of years ago and I hired an experienced, professional two-man team to install hardwood flooring throughout our home. We also have a staircase leading to the terrace level (basement) that had the original builders’ bullnose treads and risers. Since we wanted hardwoods installed all the way down to the landing of the stairs we decided to have our installer rip out all of the treads and risers and replace them with all solid oak hardwood risers and treads. He quoted us a price and told us how long it was going to take to get the job done in addition to the hardwood flooring installation. Long story made short, he was not an "experienced" staircase builder (we didn’t know that at the time), although he was truly masterful at installing the flooring. I think he came out on the short end, profit-wise, for completing the stairs because it took him twice as long as he quoted and he didn’t mind telling us so. We were happy with the result and I think he was too because he really took his time to get all of the angles cut properly on the 90-degree landing halfway down the staircase, as well as the rest of the staircase. Photos of our staircase may follow in the coming weeks (my honey-do jar has a note stating: trim needs repainting on stairwell). The reason I’ve gone to the trouble of mentioning my experience is to highlight the fact that stairbuilding with angles and curves is DIFFICULT…even for experienced carpenters. This is one area of homebuilding that should definitely be left to the professionals! 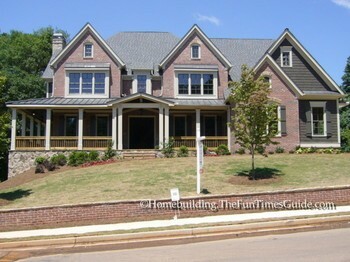 I’ll be posting a whole-house review on this home soon.